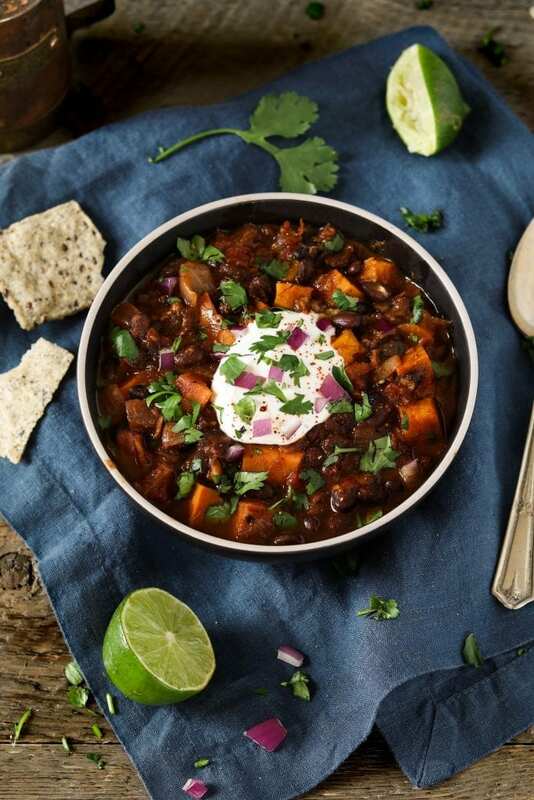 This Sweet Potato Black Bean Chili has the perfect balance of smoky heat and subtly sweet flavor. Looking for a comforting weeknight winner? Well, look no further because this Sweet Potato Black Bean Chili might be what you need. It’s warm, hearty and so darn easy to make! It’s all made in one pot and takes less than 35 minutes on the stove. You can make it ahead of time or even store it in the freezer. It makes the perfect work lunch too. Your coworkers will be lurking so beware. Chili is quite versatile and you can easily adjust it to your liking. 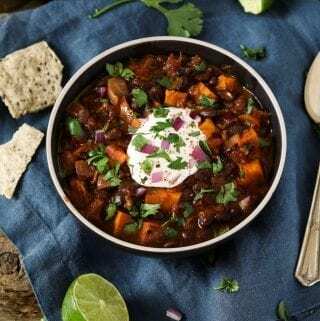 You can add tons more veggies like in my Three Bean Mushroom Chili or keep it simple with this Sweet Potato Black Bean Chili. It really is a meal all on its own, but if you’d like, you can side it with rice, quinoa or some Gluten-Free Cornbread. You won’t need any fancy ingredients, just some kitchen staples and pantry items. You’ll need grapeseed oil, red onion, fresh garlic, sweet potato, chili powder, ground cumin, oregano, cayenne pepper, unsweetened cocoa powder, vegetable broth, fire roasted tomatoes, black beans, lime juice, salt & pepper. That’s it! This is definitely the key ingredient for an ever-so-tasty chili. The chocolate balances out the sweet, spicy and acidic flavors and brings it all together. It adds a whole other layer of flavor and it will turn your everyday chili into a bold, robust, award-winning chili. 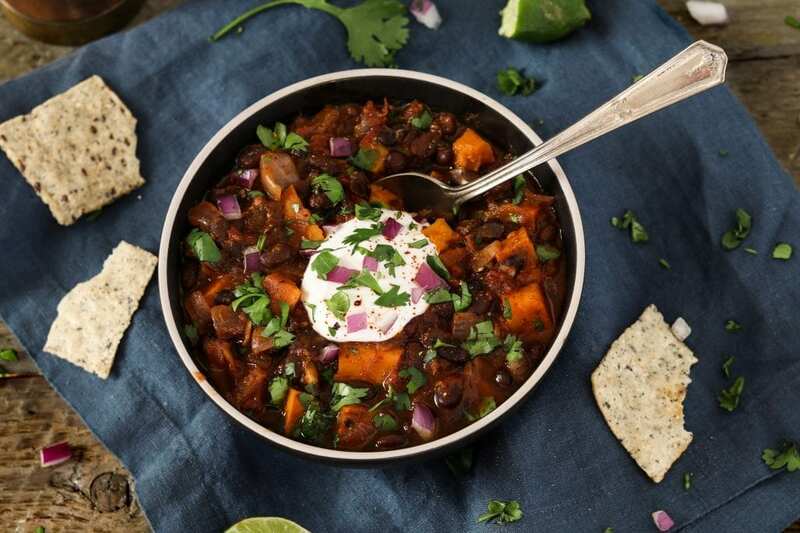 If you make this Sweet Potato Black Bean Chili, I’d love to hear what you think in the comment section below. It would really make my day. You can also follow me on Instagram and share your creation with me. Just tag me @veganhuggs and hashtag #veganhuggs so I don’t miss it. In a large pot, heat oil over medium heat. When hot, add onion and a pinch of salt. Sauté until onion is translucent, about 5-6 minutes. Add garlic and sauté for 1-2 minutes, until garlic is lightly browned. Add potatoes, chili powder, cumin, oregano, and cayenne. Sauté 1-2 minutes. Now add tomatoes and cocoa powder, stir to combine well. Add broth, salt, and pepper. Loosely cover the pot. Turn heat up to get a simmer going. Once simmering, reduce heat between medium & medium-low to keep a light simmer. Cook for 15 minutes. Keep an eye on everything and stir occasionally. Now add the beans. Uncover the pot and lightly simmer for another 10 minutes or until liquid cooks down a bit and potatoes reach desired consistency. Remove from heat and stir in lime juice. Taste for seasoning and add as needed. Let the chili rest a minute before serving. Check out notes for topping ideas. 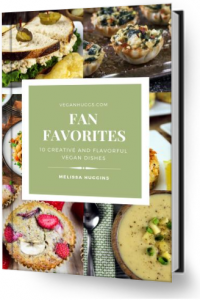 * Topping ideas: fresh-cut cilantro, vegan sour cream, diced red onion, fresh-cut green onion, and vegan cheese shreds. Is this recipe from Vegan Richa’s new book?